For a hunter, few things can be more frustrating than pursuing a downed animal across rugged terrain or in deep woods, thick with underbrush. 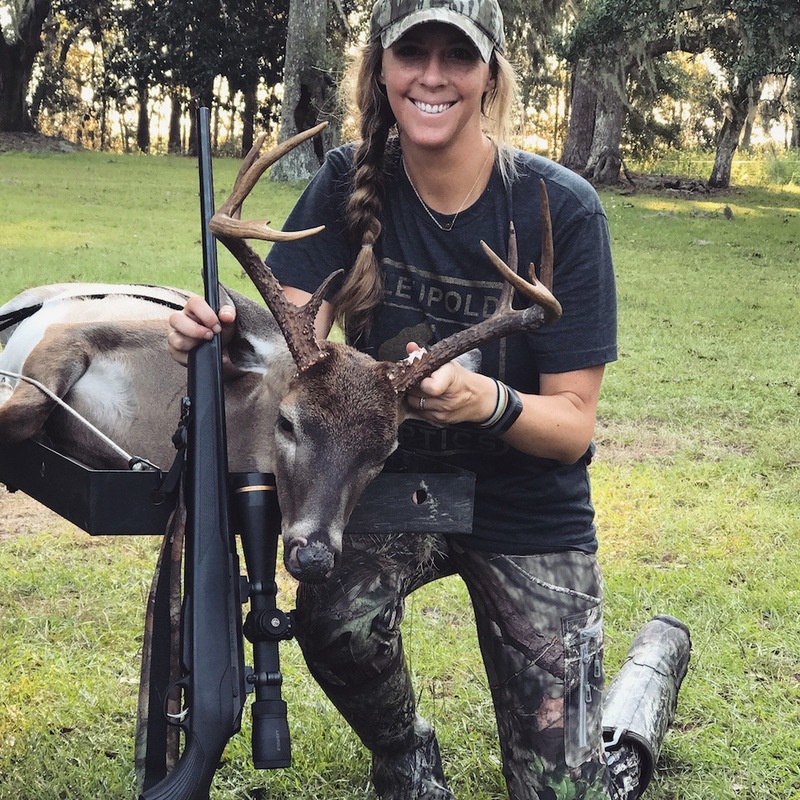 The feeling of excitement after taking a shot at that trophy buck can quickly be replaced by one of hopeless failure once hours of searching have left you emptyhanded. It’s a situation all hunters do their best to avoid. We’d love for every shot to be perfectly placed, dropping game in its tracks—but that’s just not how hunting works. Deer are incredibly strong creatures, and the adrenaline surging through their bodies often gives them the strength to run an astonishing distance, even with a mortal wound. We owe it to our game to give our best efforts for recovery. Following these simple steps can lead you straight to success. The Bright Side of the Road is sponsored by Leupold. Tracking wounded game begins before you ever take the shot. 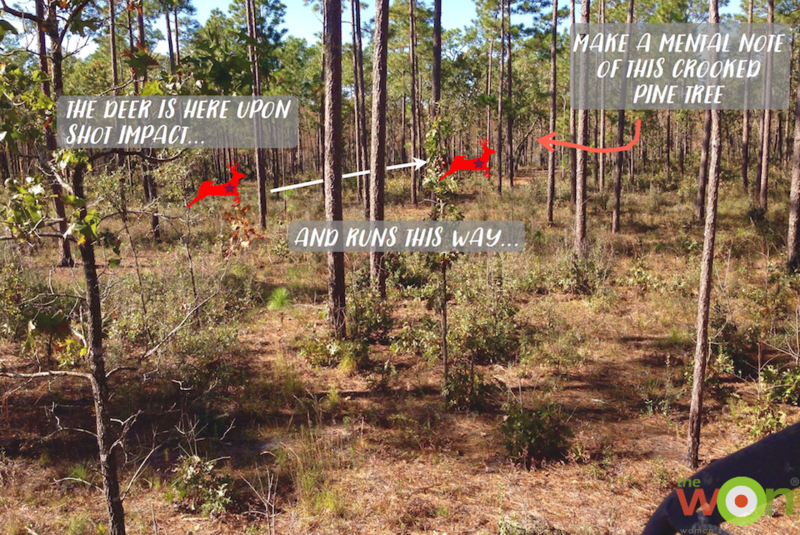 Prior to pulling the trigger, take note of where the deer is located—a particular tree it is under, or a bush it is beside—as well as the direction the deer came from, and the direction it is facing. 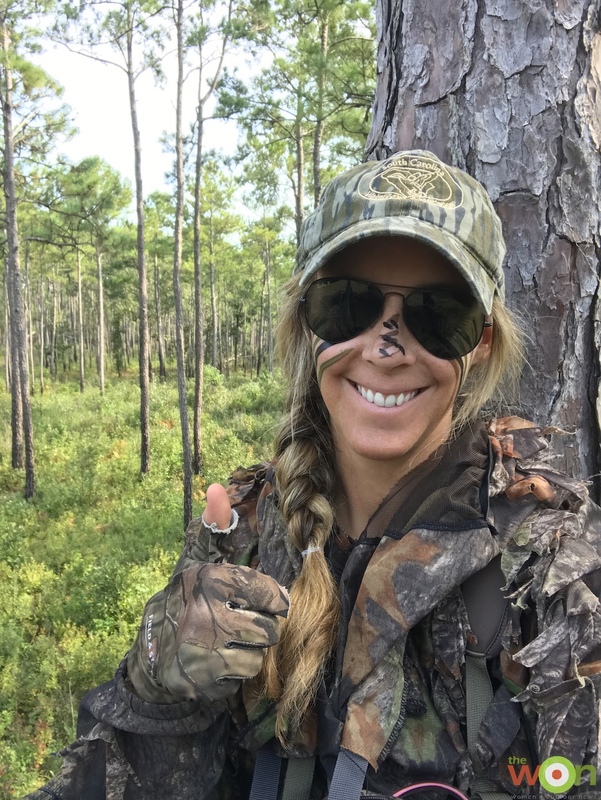 Thumbs-up to a successful deer season! When a deer has been hit, it will often dash back toward where it came in, but it might make a hard turn once it is out of sight. Take note of the direction it runs after you fire, using the bush or tree for reference, and also how it reacts post-shot. Did it look hit? Deer will often jump upon impact, arching their backs and bucking like rodeo horses. I have seen fatally wounded deer sprint away as if they were startled rather than injured, but typically they will have some sort of distinct physical reaction to being shot. These busy woods line a thick swamp, so noting a few distinct landmarks ahead of time is essential to tracking game. While it may be tempting to jump straight out of the stand, unless you see your deer fall dead within your field of vision, it is important to wait before pursuing it. Let it get a comfortable distance away to bed down and expire. Again, the deer’s adrenaline is surging and survival mode has kicked in, so it could very easily jump back up and continue to run if it still feels chased. Based on your shot, you’ll have to make a game-time judgment call on how long to wait. Once a reasonable amount of time has passed, climb down from the stand and go straight to the tree or bush you initially marked, and look for blood or hair without moving any farther. Once you find a spot, mark it with neon trail tape or a piece of white tissue and take note of how the blood looks; it will be a good indicator of your shot placement. If the blood is bright red and/or has air bubbles, it is likely a lung shot or main artery. The deer probably won’t be too far away—likely within 100 or 150 yards—but you might want to wait a few more minutes before pursuing further to make sure it has bled out and expired. If the blood is dark red, or if there are just a few drops of it, there are two potential scenarios. First, you may have hit muscle, or made a “meat shot” (i.e. the hind quarter). Unfortunately, those shots have a lower probability of recovery, and may not even be fatal. In that instance, definitely wait a few hours before continuing on. On the other hand, those few dark red drops could indicate a liver or kidney shot—a mortal wound. If that is the case, odds are that the deer will be less than 50 yards away. The same goes for neck shots, which are less likely to be fatal unless you hit the carotid artery or jugular. You’ll either find very little blood (and probably never find the deer), or you’ll be absolutely certain the deer is mortally wounded. Trust me, if you hit the carotid or jugular, you’ll know. I hit this buck in the neck (the only shot opportunity I was presented) in 2013, and he went down just a few yards into the woods before falling. As you can see, I definitely hit a major neck artery, and he was dead in seconds. If you find blood mixed with a darker brown, more pungent substance (i.e. stomach contents), the deer has been hit in the paunch—a gut shot. The deer might bed down within a few hundred yards, or run half a mile before stopping, so back out of the woods and wait at least 4 hours before tracking again. If there isn’t much blood, or very little stomach contents, you may need to wait until the following day. It’s an unfavorable situation, but giving the deer ample time to expire (or weaken to the point that it cannot take off again) is key. Bringing a few friends, or even a dog, back to help will greatly increase your chances of recovery. Once you’ve found the initial blood trail and determined the type of hit, move on in the direction the animal went upon being shot. The smaller “splatter” drops of blood will help indicate the direction of movement. A deer will often take the initial path of least resistance, but it will quickly head for thick cover or water. Try to stay slightly to the side of the trail to avoid contaminating it. You don’t want to accidentally step on the one crunchy leaf with a trace of blood on it. If you can’t find another spot of blood a relatively short distance away, go back to the original spot and work another direction. Remember that blood won’t always be directly on the ground—be sure to look at the sides of trees, on top of stumps, and at broken twigs or branches. A flashlight with multi-color options, like green and red bulbs, can help to illuminate blood better if you are searching in the dark. Thankfully, as technology continues to develop in the outdoor industry, there are a few new products we can utilize to increase our success. 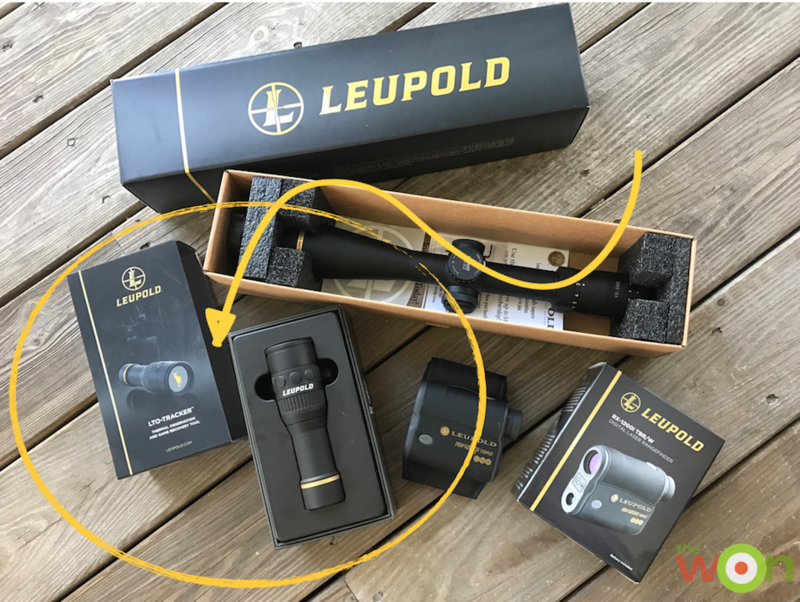 I was lucky enough to be able to try out one of those products—the LTO-Tracker by Leupold. The LTO-Tracker is a compact thermal imager designed to aid hunters in hunting and in recovering game. Its thermal sensor detects a wide range of temperature variances, and the fixed-focus 6X digital zoom has a detection distance of up to 600 yards. The tracker also has 6 different thermal palettes, so you can adjust it based on any given situation. 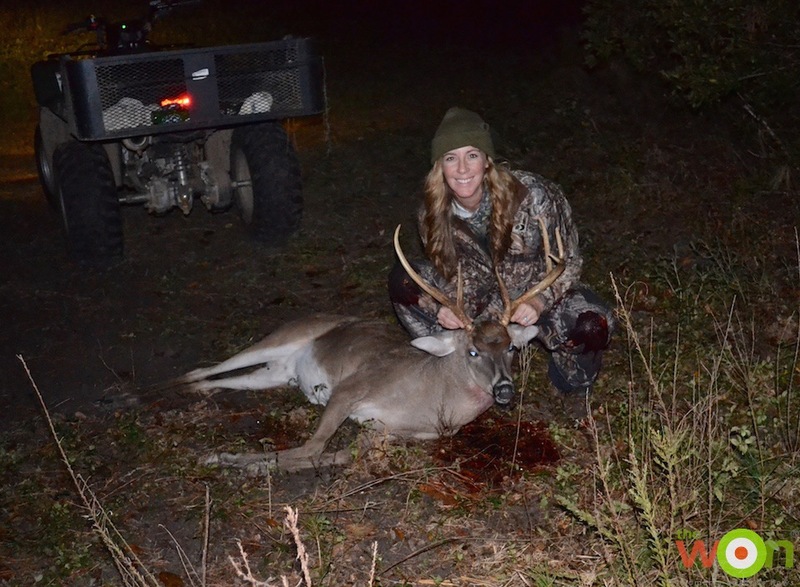 Leupold sent it to me over the summer to use this deer season, and I was excited to put it to the test. The LTO-Tracker is small enough to fit in your pocket. I got my the first chance I had to test the tracker on deer while I was still in the car, and it did not disappoint. On the way into a property I frequently hunt, there is a large field beside the road where deer love to graze in the late afternoon. Sure enough, about 300 yards away, I spotted a little herd of deer. I quickly rolled down my window to capture them with both my phone and the tracker. My phone was zoomed in as far as it could go, but I only had time to zoom in a bit with the tracker. Keep in mind that this was in July in South Carolina, so the lack of temperature variance put me at a slight disadvantage—everything in that field was baking in the 100-degree summer heat all afternoon. 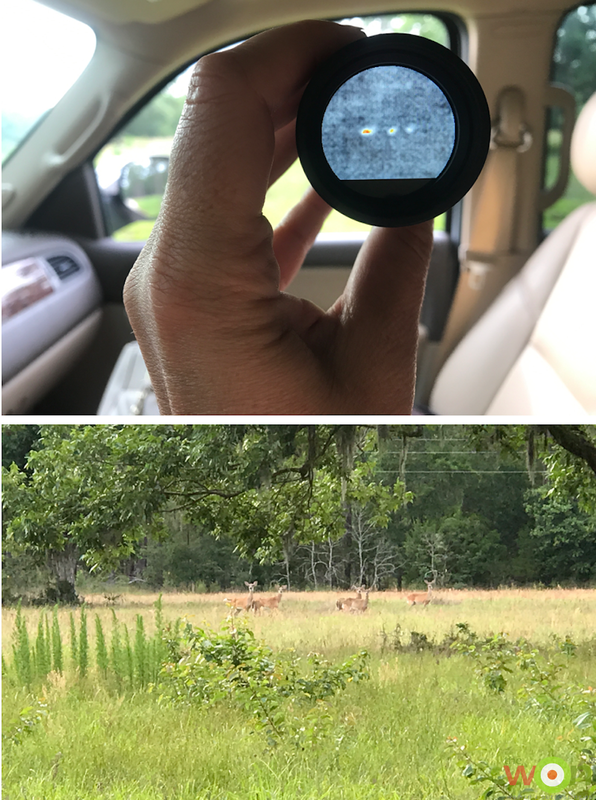 The LTO-Tracker still did a great job of picking up those deer in the field, even though they were standing in front of each other. A few weeks later, I had a better view of a doe and her fawn milling around in an open area, and I could really see the shape of the doe. I took the photo of the thermal tracker first, as the fawn was grazing just behind the doe. By the time I was able to snap a direct picture of them for reference, the fawn had scampered ahead about 10 yards. When deer season opened, I hit the woods hard, morning and afternoon, with my tracker in hand. Have you ever fixated on a smooth, sharp tree branch as the evening light disappears, convinced it’s the rack of a trophy buck waiting until dark-thirty to step into the field? Slide the LTO-Tracker out of your pocket and check it out. It will quickly become apparent if your eyes are playing tricks on you, or if you should prepare to take a shot. In the evening, I typically stay in the stand until I am absolutely sure I can no longer identify a deer through my scope. In other words, I may be able to see the outline of a “doe” 30 yards away, but it is too dark to confirm that the doe isn’t actually a young button buck. While the thermal tracker may not illuminate antlers, I’ll at least know whether or not I’m about to spook a deer when I climb down from the stand. For morning hunts, I like to get to the stand about an hour before first light; I often find myself hearing “deer” before I can actually see anything through the dark. If you have spent any amount of time in the woods, a loud squirrel or two causing a ruckus on the ground has likely tormented you while you hunt, as they somehow manage to sound exactly like a big doe cruising past. It is so nice to be able to direct the thermal tracker toward the sound, and prove (or disprove) my suspicion that a deer is actually nearby. 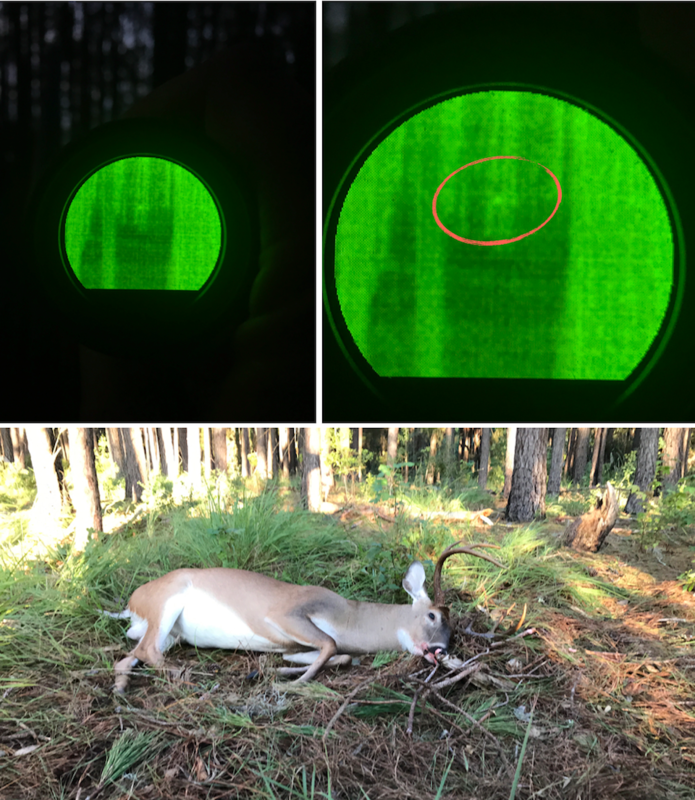 When it comes to using the LTO-Tracker for downed game, I put it to the test a few weeks into the season. 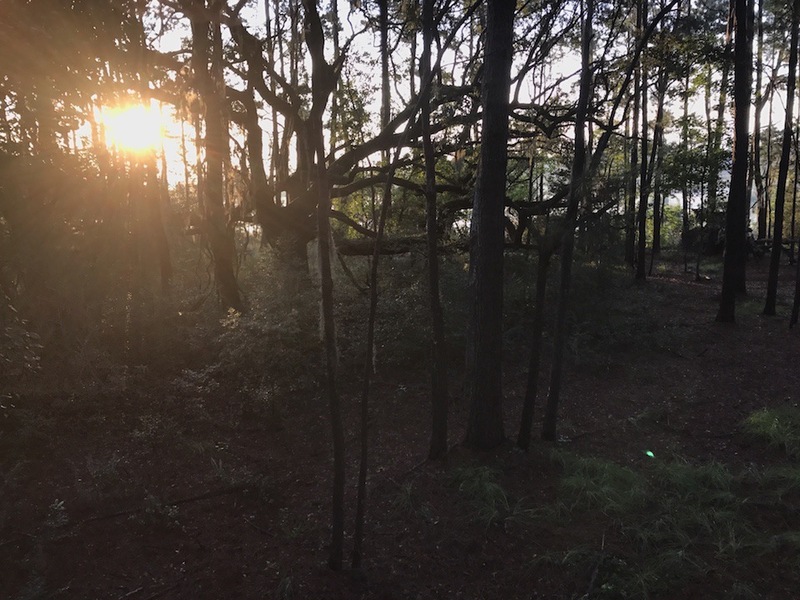 I hunted a stand tucked into the corner of some thick woods that bordered a swamp on one side, and a large pond on the other—a perfect cut-through for deer on the move. The ground is a mix of flat, matted pine straw, tall grasses, and thick brush. A downed deer will either be super easy to spot, or you’ll have to do some careful tracking. I could only hunt until about 8 that day and, based on my trail camera photos in the area, I knew I would either see a nice buck (or two), or nothing at all. Quietly I snuck into the woods and was in the stand by 5:15 that morning. I settled in to wait with my tracker in my lap. It was already warm, with 95 percent humidity, and the air around me was thick and muggy. Just before 6, I heard rustling to my right. I slowly raised the tracker and caught a brief glimpse of a deer’s form as it moved out of sight. My heart rate spiked. Less than 10 minutes later, I noticed movement ahead of me. It was still too dark to really see anything, but a quick peek with the thermal tracker confirmed that I had a deer in range—a big deer. Its antlers weren’t illuminated, but it was clear to me that I was either looking at the biggest doe in the state, or one of the bucks on my hit list. For the next 15 minutes I waited in torment, willing the sun to rise faster so I could count tines and pinpoint exactly who I was looking at. I kept tabs on his movement while he meandered in an out of cover, alternating between the tracker and my riflescope as I prepared for action. By 6:30 I could make out enough antler to know I wasn’t going to let this buck walk. I made a mental note of a crooked stump just beside him for a point of reference, clicked the safety off, and squeezed the trigger. Because of the dense trees and tall grass, I wasn’t sure if I had actually hit the buck—he disappeared as soon as I shot. The light filtering through the trees allowed me to clearly see him while he was standing, so I should have been able to see if he ran off. After a few seconds of panic, I saw a flash of antler between two pines, and then the rack was still. It was a direct hit, and this buck wasn’t going anywhere. 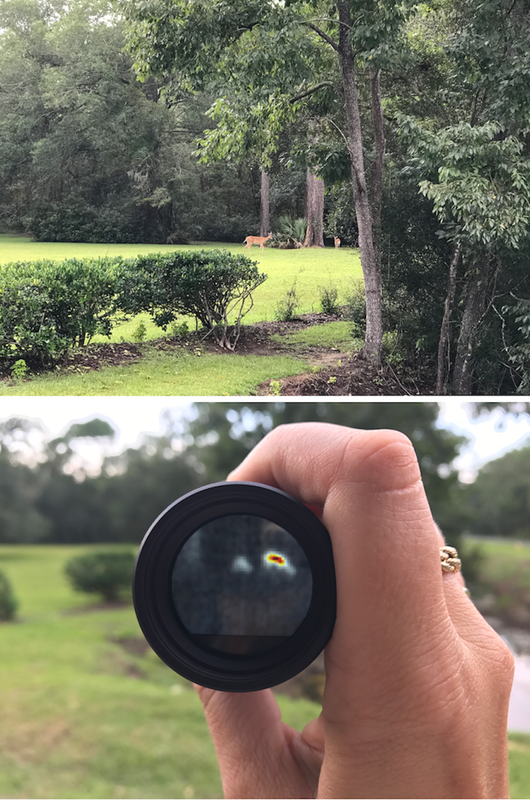 The heat and humidity were definitely noticeable in the thermal imaging, but I could clearly make out the bright green mound indicating where this buck fell. It took me a full 10 minutes to calm down enough to safely climb out of my stand, and I made a beeline to where I’d seen the buck go down. Thankfully, no further use of the LTO-Tracker or blood-trailing tips were necessary. He’d dropped where he stood, partially obscured in a patch of grass. Ol’ “One-Niner” is now on my wall and filling my freezer. Thanks to Leupold’s LTO-Tracker, I have a new confidence in the woods. I highly recommend it to anyone looking for a small, easy-to-use thermal imager, whether your goal is recovering downed game, night hunting for hogs and coyotes, or if you just want an innovative new tool to add to your gear. It will remain a staple in my hunting pack for seasons to come.